Take Flight From Indore at 09:15 Am. Reach Delhi at 11:10 Am. Pickup From Delhi airport & Transfer To Corbett approx 300 Kms/ 7 Hrs. Arrive in Corbett and check in at your hotel. Evening will be at your leisure. Dinner & Overnight at the hotel. Early Morning after Breakfast you will proceed for a Jeep safari inside the park to witness the wild life. Later you will return to your hotel. (Pls. Note if the Jungle safari is not pre booked there can be non availability of Safari. It is recommended to Book the Jungle safari through the Hotel staff calling them directly nearly 30 Days prior to your visit to Corbett).Evening enjoy some wild life movie at the resort. Dinner & Overnight at the hotel. Morning After breakfast leave for Rishikesh approx 130 Kms./3.40 hrs. Arrive in Rishikesh and check in at your hotel. Rishikesh is the yoga capital of the World, which is home to several Ashrams. Visit local sightseeing of Rishikesh including Ram Jhula- a popular landmark erected in 1986, this iron suspension bridge over River Ganges is placed at Muni ki Reti; Laxman Jhula- another iron bridge over the Ganges, it is 450 feet in length; Triveni Ghat- the confluence of holy Rivers Ganga, Yamuna and Saraswati, it is also a revered bathing spot; Parmarth Niketan Ashram- founded in 1942 by Pujya Swami Shukdevanandji Maharaj, it is placed on the banks of the Ganges; Sivananda Ashram- another popular ashram offering Yoga and Meditation along with propounding a simple way of life; and Gita Kutir Tapovan Ashram- founded in 1974 by Sri Gita Nand ji Maharaj- the ashram works for social welfare of saints, yogis and monks. Overnight at the hotel. After breakfast Depart for Mussoorie by surface approx.79 kms/2.30 hrs/( Pls. Note that there is a time restriction for the cars to enter into the city area of Mussoorie ). Afternoon arrive in Corbett and check in at your hotel. Evening enjoy some wild life movie at the resort. Overnight at the hotel. 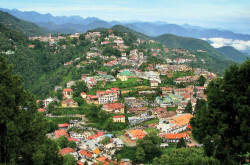 Morning after Breakfast you will proceed for half day sightseeing tour of Mussoorie visiting Gun Hill Point, Mall Road & Kempty Falls. Evening will be at your leisure. Overnight at the hotel. Morning after Breakfast check out from the hotel, Proceed for Dehradun approx. 34 kms / 1:50 hrs. You will be transferred to the airport.Take Flight From Dehradun At 14:20 Hrs. Reach Delhi At 15:15 Hrs. Take Flight From Delhi at 17:00 Hrs. Reach Indore at 18:25 Hrs.